Maybe you are having an experience like the customer I met the other day who had only recently had their beautiful cottage rendered during a huge renovation project just 3 years ago, and now finds it covered in green algae, or maybe your render has been accumulating grime and stains over a longer period of time. Living adjacent to a waterway doesn’t help, but the flare up of green algae on a rendered wall this new was a real shock to the owners. Not only the main house walls, but attached rendered garden walls together with patio and driveway were seriously infested with green algae. In addition black streaks and stains were starting to form running down the wall from things like outside light fittings, roof corners and gutter brackets. Remove stains from render. What can we do? First we need to ascertain the type of algae staining and/or fungus that’s causing the problem. 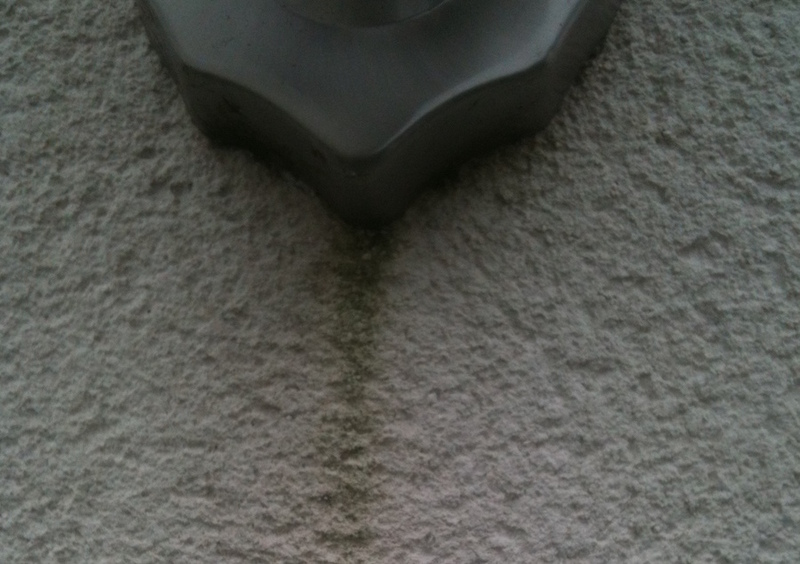 Green algae is pretty obvious but the black streaks can be more complex than just airborne mould or grime. There are filamentous fungi that produce a black stain on the render and this stain is a protective coating formed as a by-product that the fungi secretes as it feasts on the minerals in your wall. There is also another type of stain that's giving huge problems in Ireland and west Wales and this is a red stain. It's caused by an algae also and its spores are slowly migrating from the western part of the UK and is already in Pembrokeshire never before having been seen there. This is one of the issues caused by climate change with everywhere becoming more humid, with less acid rain and lower vehicle emissions. We use an alkaline gel applied to the black stained areas to break down this crusty coating. Multiple applications might be required so patience is needed. No good thinking that a quick splash and dash will eliminate the problem. Some householders will use bleach and scrub the wall with a brush. Firstly bleach, even at household strength is very unpleasant to use with a risk of skin or eye contact especially with the volumes that would be required to tackle a large scale outside job. Secondly, scrubbing your render with a stiff brush will only help to spray this stuff everywhere and will most likely cause damage to the surface of the render causing scuff marks or smooth areas. Then there’s the rinsing issue with run off leaching into drains causing damage to waterways. Green algae reacts quite quickly to some products on the market that are high strength versions of antiseptics or biocides used in hospital cleaning. A gentle spray of this biocide will kill the algae causing the render staining and because the biocide has a residual effect it will remain active for about two years by inhabiting the pores in your wall render. Any spores that land on your wall render are killed off almost immediately so the microbes that cause render stains are halted in their tracks before any serious damage is caused.